Pediatric gastroenterologist now part of a comprehensive network of physicians. Latest acquisition to expand health care options for Hudson County residents. 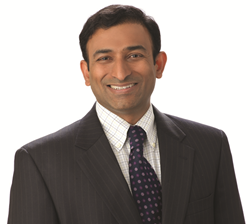 CarePoint Health is proud to announce that a leading pediatric gastroenterologist, Dr. Sridhar Goli, has joined our network, CarePoint Health Medical Group. Our system welcomes Dr. Goli to the community. Hundreds of highly skilled and experienced physicians comprise CarePoint Health Medical Group, a comprehensive network of top doctors and practices in Hudson County, representing a wide range of specialties. This latest acquisition represents CarePoint Health’s commitment to provide the highest quality care to patients and families in the communities served by Bayonne Medical Center, Christ Hospital and Hoboken University Medical Center. Dr. Sridhar Goli is a specialist in pediatric gastroenterology. He completed his pediatric residency at St. Peter’s University Hospital in New Brunswick and his fellowship in pediatric gastroenterology at SUNY Downstate. He is fluent in Hindi. We are honored to have his vast experience as a part of CarePoint Health Medical Group.